This year’s Hugo Award for best novel will soon be announced, so I thought I’d summarise my thoughts about the nominated novels. In case you’re not familiar with the Hugo Award, it’s one of two major science fiction and fantasy awards, awarded by the World Science Fiction Society (by popular vote at various conventions). You can read more about it here. Below, I have written something about each of the five nominees and ordered them in the order I think they deserve to win, with the best novel first. We’ll know which novel actually won on August 20th, but if they deviate from my own opinion, they are of course wrong. Update after the winner was revealed: I’m happy that N.K. Jemisin won the award. It was the only really good book on the list. Neal Stephenson’s would have been a contender if the last part had been transformed into a short epilogue, but the others don’t come close. The right book won! N.K. Jemisin’s novel The Fight Season is nominated for a Hugo Award this year. I normally don’t read fantasy, but I thought this looked interesting and decided to have a go. Overall, I was pleasantly surprised and I found this book rather interesting. The setting is a geologically very active super continent that undergoes cyclic cataclysms where life is about preparing for the next catastrophe. There is a mix of advanced technology from earlier, fallen civilisations and magic related to geological activity and heat. The story is composed of three threads; three women experiencing a different part of the setting and a different stage of the approaching catastrophe. The narrative is well written, the characters believable and also quite interesting. The story itself is rather bleak and there’s plenty of oppression and tragedy involved, but not to excess. I like a couple of things with this book. First, I like the concept of cyclical catastrophes that influences everything in the setting. Second, the story is well written using a device I have actually considered using myself at one point (spoiler: the three women are actually the same person at different times). Do I think the book should win this year’s Hugo? I don’t know, yet, but it beats the only other nomination I’ve read so far, which is Ancillary Mercy by Ann Leckie. Also worth noting is that three of the five nominees this year are women. Seveneves by Neal Stephenson explores a scenario I’ve been interested in for a long time. The basic idea is that the entire surface of the Earth will turn into an inferno for several thousand years, wiping out all life. Humanity gets about two years to prepare for survival in orbit. The first part of the book focuses on humanity’s collective attempt to launch as many people and as much resources as possible into orbit, turning the ISS into the centre of a “cloud ark” meant to be self-sustaining and able to survive without any support from Earth. This is of course problematic, not only from an engineering perspective, but also from a political and social one. This part is great! The second part covers the time after the catastrophe and is good too. The third part of the book takes place thousands of years later and is really bad; I seriously wish I had stopped after the second part. It feels pretty much like taking a good hard science-fiction novel (the first part) and sticking a mediocre far-future soft science-fiction novel to the end. It doesn’t work at all. I care neither for the characters nor the story. The third part should have been an epilogue, which would have chopped a few hundred pages off the book. That would have been no bad thing considering that the book is 880 pages long. My suggestion: Read the first two parts. Then, regardless if you liked it or not, do not read the third part. Here’s what happens (spoiler): They find out that there were other projects apart from the cloud ark, including one to burrow deep into the mountains and one to survive deep in the oceans. All three succeeded and the third part is an extremely roundabout and boring way of saying that. I have now finished Ancillary Justice, Ancillary Sword and Ancillary Mercy by Ann Leckie. Overall, the books are competently written and worthwhile to read. The first book is significantly better than the following two, but far from awesome. To be honest, this feels much like Lois McMaster Bujold, just slightly worse and not as funny (there are some good parts though; I loved the translators). They might be fairly bad for non-initiated readers, so I only recommend the first book to people who already like reading space opera. For the rest of you, there are better books in this genre. I’ve now finished The Aeronaut’s Windlass by Jim Butcher, which means that I have read all the nominees for this year’s Hugo Award for best novel. I’ll write something about my thoughts in general later; I’ll stick with this novel for now. The Aeronaut’s Windlass is a strange hybrid of fantasy, steam punk and intelligent cats. While the world is not described in detail, it’s clear that the surface of the planet has been abandoned and that most people live in very tall towers, or spires, that were left behind by an earlier civilisation. As the title implies, airships of various kinds are central to both the plot and the setting. It sort of works, but let’s start with the good things. The characters are interesting and mostly well-written. They are also varied and are reasonably well-connected to the story. I also like airships in general, although I like the magic aspect much less, especially on the personal level (they have gauntlets of some kind that can channel ethereal energy). The setting with an abandoned surface is also cool. What doesn’t work is the narration. The entire book feels too much like an action TV-series with almost no time to breathe or build characters or setting. One climax has barely passed before the story rushes on to the next. Most chapters finish with cliffhangers that would have been more suitable in a periodical of some kind, but make for a very tiring experience in the long run. To put it bluntly, the pacing in this novel is awful. Furthermore, there’s nothing really ingenious or imaginative about the plot, and the novel probably fits into the category of things I could have written myself given enough time. So, while I like steam punk, the setting and the characters, this is not a good novel. It would be great as a setting for table-top role-playing or similar though. I haven’t fully decided which book I think deserves this year’s Hugo, but I’m quite sure it’s not Jim Butecher’s The Aeronaut’s Windlass. I usually don’t read much fantasy, but this year I have decided to read all the nominations for the Hugo award for best novel, which includes both science fiction and fantasy. Uprooted by Naomi Novik definitely belongs to the second category. The setting is small-scale fantasy heavily influenced by Slavic fairy tales. The main character grows up in a small valley where one girl every ten years is picked by the mysterious wizard living in an isolated nearby tower. She is picked because of her latent magical powers, and the rest of the story is about her finding out about these powers, the wizard, his tower and how they fight the dark forest threatening the country. The book is interesting because of the somewhat unusual influences from Slavic fairy tales mentioned above, plus the setting itself. However, it’s also an example of why I don’t really like reading certain kinds of fantasy. Way too many pages are spent on describing magical battles or adventures that would work well in a film (which I think is planned), but don’t add much to a book. The book is fairly long, but the story would be very easy to summarise because so much time is spent on just describing what happens. While I think the book was worthwhile, it’s far from the best of the nominees I’ve read so far. I only have one left now, which is The Cinder Spires: The Aeronaut’s Windlass by Jim Butcher. I’ll try to summarise all the nominees once I have read the last one! I’ve now finished Feed by Mira Grant. It’s a well-written and fast-paced book about political intriguing in a zombie-ridden future version of the US, as observed by a team of bloggers covering the presidential race. I don’t really like zombies and I could get better intrigues elsewhere, so this isn’t my cup of tea, but if you do like zombies, this might be a good read. All three books in this series were nominated for Hugo awards, but none (rightfully in my opinion) won. I Am Legend remains the only zombie book I really like (or vampire book, or whatever). I have now finished The Goblin Emperor by Katherine Addison. It was a long time a go I read a “normal” fantasy novel (China Miéville doesn’t count as normal) and I sort of know why. Even though the book is fairly well written and carefully thought out, it simply didn’t appeal to me all that much. I do appreciate the fact that this is one novel, though, not a series, which is, sadly, rare nowadays. The setting was well-depicted but not terribly interesting. The only thing that made the novel worthwhile was the fact that it was well executed. The characters were also rather good (as in realistic and interesting), except for the main character which was a little bit too good (as in not evil). I found the names almost impossible to keep up with, though, and the book just has too much made up language (including formality levels which don’t exist in English, but that were sort of covered by using old English pronouns). So, overall, well-written, but not my cup of tea. In general, I admire the author’s ability to mix science and fiction into novels that are surprisingly interesting to read. The Mars trilogy is a good example of this. I also think he’s pretty good at creating interesting characters and stories about them, as for example in The Years of Rice and Salt. Therefore, I’m a bit disappointed with 2312. It contains a lot of science and a lot of fiction, but they feel disconnected. While interesting on their own, this feels more like a half-hearted novel interspersed with small speculative science essays. Even though the book is almost 600 pages long, it still feels like I didn’t get to know either the characters or the setting. The story feels much like an excuse to introduce the setting and is in itself rather boring. I should perhaps say a few words about the book. The story takes place in 2312 as the title suggests, in a world where most of our solar system has terraformed or is in the process of being so. The plot focuses on a conspiracy that threatens mankind’s fragile existence outside Earth, and the efforts to reveal and thwart the conspirators. This sounds reasonably interesting, but the novel feels disconnected and therefore not very interesting. I have now finished River of Gods by Ian McDonald. In short, it’s a science-fiction novel set in India one century after its independence from Great Britain. The story combines elements of a futuristic society (AI, nano technology, genetic engineering) with traditional Indian themes. The character gallery is diverse and interesting. The story appears fragmentary at first, but is tied together rather neatly. I liked this book a lot and I’m definitely going to read more by Ian McDonald. He’s very good at both describing society and the people living in it, not seldom making it both fun and interesting. If I were to liken him to other authors, I would choose William Gibson, Neal Stephenson and John Brunner. I decided to start reading Ian McDonald’s novels from the beginning, which means Desolation Road (1989). This is after being rather impressed by both River of Gods and Luna: New Moon (scroll down for my earlier ramblings). The novel starts with a certain Dr. Alimantando, student of the intricacies of time and space, who gets lost in the red deserts of terraformed Mars and founds a new settlement: Desolation Road. Strange people get drawn to, arrive in or escape to or otherwise arrive in the settlement. The narrative quickly spirals out of control, including side stories about the world’s best snooker player, a guitarist capable of channelling demonic forces through his electric guitar, a corporate worker slowly advancing through the ranks of his company by replacing everyone under him with robots, a little green man who may or may not be real, and, for some reason, Glenn Miller. It all tied together in the end, somehow, so it’s not really a short story collection, but could have been. This is magic realism on Mars, probably with a seasoning of some hallucinogenic drug. On the whole, it’s very entertaining, quite chaotic and a bit too long. Desolation Road didn’t feel similar to either River of Gods or Luna: New Moon. It’s not the best book I’ve read, but it was entertaining throughout. Next on the list: Out on Blue Six. More Ian McDonald! Out on Blue Six is the weirdest book I’ve read in a while and reading it felt a little bit like reading Gravity’s Rainbow by Thomas Pynchon. It has the same I-have-no-idea-what-the-hell-is-going-on-but-I-sort-of-like-it feeling. The story is set in a distant future in the Compassionate Society, where computers force everybody to be happy by pairing them up with the right partner, shepherding them into the right career (one that makes you happy, that is) and so on. It’s just that not everybody is happy. Some people want a little bit of anarchy, some people want to break the rules. This is what the story is about, or at least where it starts. Then down the rabbit hole it goes and it’s extremely hard to summarise what happens next, but it contains the King of Nebraska, angels, a teleporting woman with a cybernetic cat, judgement day (literally) and lots of raccoons. Unfortunately, the book suffers from the same problem as Gravity’s Rainbow does: I don’t really care about what happens, neither with the main characters nor with the plot. Since Pynchon’s language is extremely entertaining to read, I still liked Gravity’s Rainbow, but while this book is entertaining, it fails to be anything more than that. I have a feeling that I won’t remember anything about this book five years from now, whereas many parts of Gravity’s Rainbow are still with me, even though it was seven years ago I read it. I’ve now finished Chaga by Ian McDonald (Evolution’s Shore in the US). After having read a couple of his earlier, rather bizarre novels, this one is much more serious and feels comparable to the later novels that I liked a lot. This novel is the first in a trilogy focusing on Kenya and the impact on the country and its people when alien life starts spreading from a crash site on Kilimanjaro. In short, the novel is fairly interesting and rather brutal, but not as sophisticated as his later novels. One thing I didn’t like in particular was that the book almost felt like it could have ended after about two thirds, and the remaining third didn’t feel interesting enough. While I don’t regret that I read the novel, it’s still not as good as either the later novels written in a similar style, also about emerging economies (India, Brazil, the Moon) or the earlier, more freaked out ones. I will probably not read the remaining two books in the trilogy. I am, however, looking forward to the sequel of Luna: New Moon, which is projected for a release later this year. I’m done with Neptune’s Brood by Charles Stross, having previously read Saturn’s Children (which is completely unrelated story-wise, but takes place in the same universe). Neptune’s Brood is actually far better than the previous one, so I recommend anyone interested in Charles Stross to read this one instead. The story is complex and revolves around an interstellar banking fraud of epic proportions. The main character is drawn into the intrigue, first mostly as a scholar of interstellar banking frauds, but as the plot thickens, she turns out to have a much more involved role than that of a random bystander. The novel contains a few really entertaining characters, is generally well-written and overall a better story than Saturn’s Children. The setting is post-human space where androids and other life-forms have supplanted mankind, but where things still work much the way they would if humans were still around, except on a bigger scale. While interesting, the setting is not the main attraction here, the characters, the storytelling and the plot are. The novel was shortlisted for the Hugo Award in 2014. I just finished James S.A. Corey’s book Leviathan Wakes, a novel that felt very interesting while immersed in it, but which does appear a bit bleak in retrospect. I think this might be at least partly because the book has some appealing points, such as great characters and dialogue, but lack something that makes it interesting in the long-term. I don’t feel like summarizing the plot, but we’re talking about fairly realistic and sometimes brutal interplanetary science fiction with lots of space ships and stations. The book is character-focused and with interesting characters in general, this makes it a good read. However, I don’t feel it’s good enough to continue reading the series (this is the first book in a series called The Expanse). Against better judgement (see my previous review), I have now read two more books in The Expanse series, which brings me to a total of three. I decided to keep reading after I watched the TV series, which was better than expected. However, I must say my initial judgement was accurate. While there are entertaining characters and sometimes interesting plot elements and a well-written setting, the overall story lacks something. I’m still not sure what it is, but the overall story just feels unsatisfactory to me. I probably need to think about this, but it seems the plot is too superficial and works mostly like an action movie. I would give the latter two books perhaps 3/5, so they might still be worth reading if you really liked the first book. If you found the first book fairly good but not excellent, then that’s probably enough. Do watch the TV series though! Looking forward to season two. But I’ve read enough in this series. Any suggestions for what to read next? More Charles Stross is high on my list. After having read two books by Charles Stross (Saturn’s Children and Neptune’s Brood; I highly recommend the latter), he has established himself as a very intelligent author capable of writing intriguing stories populated by interesting characters. I selected The Family Trade as my third book more or less randomly, which might have been a mistake. The book is parallel-worlds fantasy (modern US with some kind of medieval alternate history were the Vikings has colonised America). While he does some interesting things with the “world walking” itself, as well as some interesting things with the settings, I’m not impressed at all. As is the case in Neptune’s Brood, economics plays a certain role, but ignoring that and some of the violence, this novel feels like something Stross would have written when he was 20 (he was 40 when the book was published). It’s also the first book in a long series and there’s very little chance I will continue with it. Definitely not my cup of tea! Accelerando by Charles Stross is one of those books that it’s really hard to wrap your head around to write a review. It’s a chaotic collection of short stories that are sometimes hard to follow but great at least some of the time. They describe the transition from a modern society (or a parallel version of it at least) to a post-human technological singularity through the eyes of three generations (before, during and after the singularity). After the first few pages, my expectations for the rest of the book sky-rocketed, but I must say that the rest didn’t really impress as much. While some concepts and the language never become boring, the book simply isn’t coherent enough to work well as a whole. One criteria I think is interesting to evaluate when reviewing books is if, in theory, I could have written the book myself. Accelerando places itself very firmly in the “no way what so ever” category, much more so that most other science fiction I read. It’s not only the way Stross writes (which is probably the main reason for reading the book), but the audacity and scope of the imagination on display here. If you’ve read this far and think this sounds cool, you should give this book a try. I expect people who won’t like the book stopped reading after the first paragraph, so no reason to tell them to avoid it. This blog has been online for more than ten years, but it’s been through many transformations and, in recent years, decline. As I increase the amount of text I write elsewhere, I simply don’t feel the need to write much here. I only write when I want to write something which is too long for social media and when I have news to share that I want friends, family and acquaintances to read if they are interested. I will still live in Stockholm, so I will have to commute to Uppsala (roughly 90-minutes door to door). I think this will be okay since I can work on my own projects on the train. This article was written on the way back home from Uppsala, for instance. This is a part time job (50%), so I plan to combine it with all the other things I’m doing. I might be a bit naïve in thinking that I will be able to manage this, but I think it’s possible. I will of course put some long-term projects on a lower priority and I will postpone other projects I have planned, but on the whole, I still plan to continue my work on/at Hacking Chinese, Skritter, WordSwing, About.com and my thesis, along with teaching a Chinese writing course at Linköping university. It might sound like a lot. It probably is. 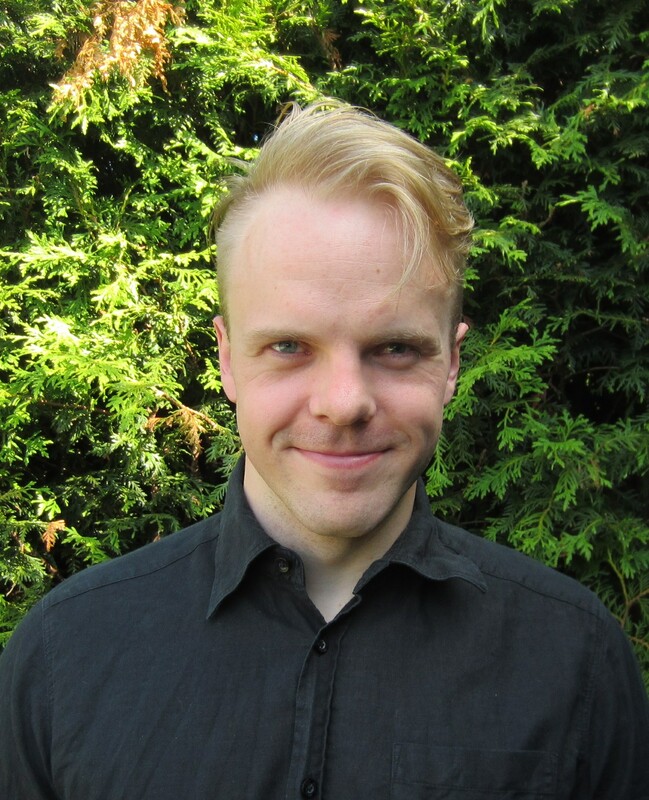 I applied for this job because the work description seemed to be a perfect match for me, and I think working with other people who are equally enthusiastic about language learning and teaching, but for other languages will be very stimulating. I also think that this is an excellent opportunity to familiarise myself more with Chinese teaching in Sweden and the key people involved. Up until now, I’ve had an international focus and have largely neglected Sweden, but this is still where I was born and where I live. Right now, everything is new and it’s difficult to say anything substantial about the job itself and what I think about it. My days are mostly filled with preparations for a course that starts in a few weeks and sorting out practical things in the workplace (my desk looks quite tidy now, at least). I’ll have more to say in a month or so. Who knows, I might even write about it! This is the last book in the trilogy about Blue Ant which started with Pattern Recognition. While the first two books were only loosely connected, this final and third book is more like a continuation of Spook Country, with mostly the same characters. Gibson is very reliable and this book is as good as the others in this trilogy. If you’ve read the others and like the style, read this one too. I had a project a few years ago to read all novels that have won the Hugo Award, but it failed because I couldn’t find two of the older books that were out of print. I finally got my hands on this novel by James Blish, which turned out to be a bit disappointing. I never really understood the case of conscience that gives the book its title, or I did understand it but simply didn’t find it interesting enough. Still well-written and interesting for other reasons, but perhaps a deeper knowledge of theology is a prerequisite to really like the book. Apparently, it was first published as a novella and later extended to a novel, perhaps it ought to have stayed in its shorter form. Having finished Zero History, I didn’t feel that I had read enough of William Gibson just yet. His style is refreshing, the characters interesting, the setting fascinating and… well, I could go on, but let’s just say I wanted more of Gibson. The setting of this trilogy is the San Francisco–Oakland Bay Bridge after a devastating earthquake. The bridge has been abandoned by the authorities and replaced by a anarchic society of ordinary people, criminals and outcasts. Chevette Washington, a bicycle messenger living on the Bridge, who gets into a lot of trouble for stealing a strange pair of high-tech googles (the young messenger girl feels very similar to Y.T. in Snow Crash by Neal Stephenson, which was published two years before Virtual Light). Rent-a-cop Berry Rydell is at the same time hired to retrieve the very same glasses, but of course it turns out that much more powerful elements are involved. In Idoru, the story moves on to the virtual (digital) Japanese superstar Rei Toei, who has recently made the headlines because rock star Rez wants to marry her. This doesn’t go down too well with the Rez fan club and Chia is sent to Japan to find out the truth about her idol. The bigger plot is then wrapped up in All Tomorrow’s Parties as the story returns to the Bridge and Chevette and Rydell. Most of the loose threads are tied together, including the idoru (Rei Toei) and a Taoist philosopher-assassin. Throughout the trilogy, Gibson shows that he was a competent writer two decades ago as well, even though I must say I think that he has developed a lot as an author and his later novels are better. This trilogy is still a great read, though. Gibson is really, really good at creating great settings and populate them with interesting characters. He’s also witty and a joy to read in general. The only novels left now are The Difference Engine (1990) and The Peripheral (2014). This is the first book I read by William Gibson since reading Neuromancer and its two sequels more than ten years ago. Pattern Recognition is the first book in a trilogy which isn’t really science fiction, but more like a tech-oriented modern thriller. In any case, Gibson is a great author who possesses the rare combination of interesting ideas and the ability to write. While it seems he’s best known for his futuristic ideas, at least in earlier novels, I’m more impressed by his way of writing. Continued below. This is the sequel to Pattern Recognition and is similar in many ways. That means that I also liked it a lot. The story is perhaps slightly more interesting, but the main benefit of reading this book is still Gibson’s way of writing. He’s really good at capturing both characters and scenes in just a few words, vividly and often in an obliquely humorous way. I have read few authors in recent years where I envy the author’s ability to write more than I do when reading Gibson. I picked this book up mostly by whim, but felt that reading something business related would be interesting. The main lesson I learnt from this book is about the triple roles anyone who runs his own business plays (creation, marketing and business). This has actually helped me rethink my current situation (I run a small business), but I didn’t like the book in general. It feels way too American and has a number of ideas that are taken for granted that I don’t really agree with. The first book I read by Neal Stephenson was Snow Crash and I have since re-read it once in English and once in Chinese. His other books have been good, but far from awesome, so I was a bit sceptical when I started reading Quicksilver. It’s a real brick of a book, almost a thousand pages, mostly set in 17th century Europe and focusing on different themes such as natural philosophy and politics. The novel is, as far as I can tell, well researched and feels genuine. It’s written in a myriad of different styles and highly digressive, reminiscent of Thomas Pynchon, but slightly more readable (although not necessarily better). The book is divided into three sections and if all were as good as the second part, this would be a really good read, but now it just feels too long. I might consider reading the two other novels in this series later. An interesting and well-written book about writing novels. The book mostly consists of loosely strung together articles, often just a few pages long, about a wide range of topics related to writing novels and being an author by profession. I don’t think I learnt much about writing novels from this book, but it did spark my interest to actually finish some of the projects I’ve been working on. I recommend this book to anyone who is thinking about writing fiction. I picked up this book mostly because it was mentioned in Göra Hägg’s book reviewed above as a good example of how different perspectives and time frames can be used to tell an interesting story. I wasn’t disappointed. The book is about one of Sweden’s most infamous serial killers, and even though it takes the shape of a novel, the book is actually an historical account based on a large number of interviews and other documents. This way of presenting the data is very effective and as interesting to read as any thriller. 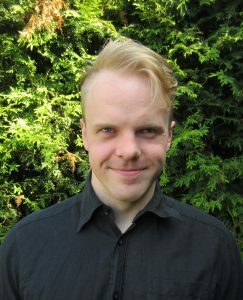 Olle Engstrand -Hur låter svenskan, ejengklien? I have all my phonetics training in Chinese (and some in English) so reading about Swedish pronunciation is very interesting. As the title implies, the focus of the book, at least the earlier chapters, is how Swedish is actually pronounced (as compared to orthography, how the sounds are spelt). This differs a lot from what most people think (including myself, sometimes). Still, the book then spends a lot of time talking about subjects I’m less interested in, such as various dialects and historical development. Still a good read on the whole. I have read several of Willis’ novels before, some of them set in a historical setting but from a modern angle (the main characters are time-travelling historians). This time, the historians get stuck in London during the Blitz, a very bad time to be stuck in indeed. As an historical novel, Blackout is great. It made the Blitz feel real and was genuinely interesting. However, the book is only the first of two, so let me finish my little review below. Blackout ends in the middle of the story and All Clear is the sequel. Actually, it’s the story I like the least in this double-decker. The main characters are separated at the outset and way too much time is spent on people running back and forth trying to find each other. The overall plot is okay, but it takes too many pages to tell. In the end, though, I found both books enjoyable. Willis is a competent writer and manages to make the setting come alive. Four snails. I have read a few books by Charles Dickens before, the most recent one being Hard Work, which I read as part of my studies in English literature at university. Dickens is an author I almost expect to be boring because of his fame and status, but really like when I get down to actually reading him (I remember feeling the same way when reading Hard Work). I love the narrator’s irony and the way the story is told. Dickens is also very, very good at describing villains, and although the overall story feels a bit contrived, the positive still easily outweighs the negative. This is a basic introduction to second language acquisition that I picked up somewhere and felt like reading. It doesn’t contain much I haven’t already studied, but it doesn’t hurt to reread stuff like this. Rod Ellis is one of the major figures in the second language acquisition field, and this book, which is in the Oxford Introduction to Language Study series, works well as an introduction. The only drawback is that it was published in 1997, but most of the content is so basic that this hardly matters. This book has been on my ought-to-read list for a long time and now I finally got around to reading it. I must admit I don’t understand its greatness. It could be because I never felt alienated as a teenager and the setting feels distant (mid-century New York). It could also be because I seldom appreciate vernacular language in books (several “I really did” or similar per page or “that killed me” once per paragraph). As a window into teen alienation, I can see the value of reading this book, but I didn’t enjoy reading it much. I really didn’t. The 31st year of my life was an eventful one, even though it certainly doesn’t seem like that if you just look at the paltry output on this website; I only published five articles since my last yearly summary. 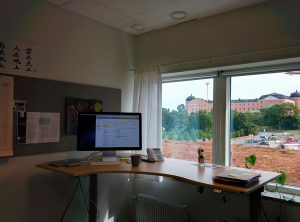 Among other things, I have left Taiwan and returned to Sweden, which includes finding a new home and settling in. I have also finished all the courses of my master’s degree program and now “only” have my thesis left. I’m also trying to convert Chinese from a very time-consuming hobby into something I can live off. Apart from this, there have also been other changes in my life, big and small, and in this post I’m going to discuss them briefly, as well as the general state of things. To make it more accessible, I have divided the content into several parts. If you want to see what I wrote last year, you can find that year’s birthday report here. The most significant change was my moving back to Sweden from Taiwan. Zoe and I have bought an apartment in Stockholm, and we both like it and the surroundings quite a lot. It also feels great to have put the long-distance part of our relationship behind us and to be able to look forward. Returning to Sweden wasn’t easy since we were only renting a small room for the first couple of months and, added to that, ran into some other problems, but since we moved into our new apartment, things have gone swimmingly. I will miss my friends in Taiwan, I enjoyed all aspects of my life there immensely, but this is still where I belong. I haven’t fully grown used to living in Stockholm, bu in general, all is well on the social front. My final semester in Taiwan was as interesting as the ones that came before it (I have already written about this elsewhere), but during this time, I also started doing my own research. Or, to be more accurate, I started trying to figure out what I wanted to research, and once I had decided, to read up on the relevant books and articles. 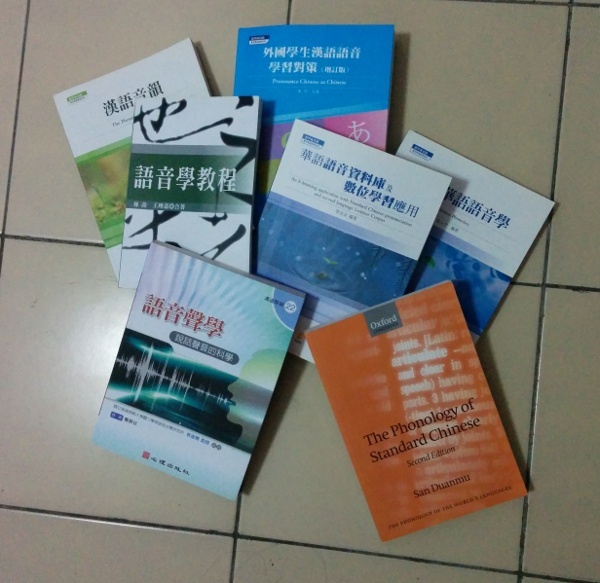 My area of research is tone perception and how it can be trained in adult learners of Mandarin Chinese. After returning to Sweden, things have been going slowly, but at least they haven’t been standing still. I should be able to do start doing actual research fairly soon! Apart from this, I don’t study much. I use Chinese on a daily basis, write about it and most other things I do are related to Chinese in some way, so I still learn, but without focused studying. Since I launched Hacking Chinese Challenges, however, I have been able to spend more time on my own studying and that feels great. I hope I will be able to keep enjoying Chinese even if I work with the language full time. Even though I haven’t finished my degree yet, I still focus much more on work than studying at the moment. All work I’m doing is related to Chinese in some way or another. Apart from Hacking Chinese, where I spend most my time, I also do some private tutoring, translation work and freelance writing for About.com and Skritter. For Skritter, I also do Chinese language support and some other things. On the whole, the mix is quite good, but I wish I could spend more time on my own projects. The reason I don’t is not for a lack of ability or opportunity, I’m simply too slow and avoid taking risks, preferring to stick to what I’m doing and know works already. This is something I will have to work on if I want to focus more on what I really like doing! Both creative input and output have been dismal most of the year, with a few brighter periods when I read and listened to a lot of books (I finished six in January and almost as many in February) and where I worked a little bit on my novel. Still, I haven’t produced much and I still don’t have a draft of the novel ready. Creativity is something that has been put on the back burner for too long. My recent frenzy of book reading is one sign of this, but I hope to be able to find the time and energy to actually create things, too. While living in Taiwan, I was able to practise as much gymnastics as I wanted, which was a lot. Apart from studying, I had few other obligations and enjoyed this immensely. I competed in gymnastics for the second time in May and it went slightly better than last time. It’s still on an amateur level, of course, I started just a few years ago, but it’s still fun. If someone asks if I’m an old gymnast, I usually reply that I’m old and a gymnast, which is quite different. Since returning to Sweden, I have mostly gone to the gym, along with some jogging. Not much, in other words. Until recently, that is. Since the beginning of February, I have been able to practise gymnastics again, which is great fun. I had almost forgotten how much I enjoy it. It’s only two days a week, about two hours each time, but the facility is excellent and so are the instructors. I have also started helping out with classes for some of the youngest gymnasts. All this, combined with some strength training at home, adds up to a decent routine. I need to do this for a few more weeks to really settle in, but I’m optimistic. Things are going well and I’m happy with my life. I need to make sure to not let my education slip (make too slow progress on my thesis and fail to study Chinese for my own sake) and see if I can’t allocate some time to creative output. Writing this post made these two things very clear, so now it’s just a matter of doing it. Let’s see what i have to say a year from now! Overall well written, although less interesting conceptually than the other books I’ve read by the author before (The City and the City comes to mind). Neat story, interesting plot, okay characters. The only complaint is that the main characters felt a bit passive in the story and experienced it more than taking active part in it. Still very good. He’s good at making the very bizarre feel quite natural. Four snails. This is the follow-up to Fooled by Randomness, a book I enjoyed immensely. This one was interesting too, but much less so that the first book. The author presents interesting ideas in an entertaining way, but I’m not really a big fan of his style and he comes across as somewhat opinionated at times. I also feel that this book could have been shorter. Three snails. This book actually takes place before The Scar, but they aren’t dependent on each other at all, and I found no problems reading them in this order. This book has better characters, a more interesting setting and better language than The Scar, but the plot feels weaker. Perhaps the book is also a little bit too long, but I would say it’s still better than The Scar, but not enough to earn five snails. Thus, four snails. This book could have been about half as long without losing much. Again, the author has some interesting ideas, but in this book, he becomes less and less convincing and starts ranting more and more. I found parts of this book brilliant, but others were either boring or simply not convincing enough. Read Fooled by Randomness instead. Two snails. Sadly, this novel combines the bad aspects of the two previous novels (see above). Despite its length, I never got to know the main characters and didn’t really care about them at all at any point throughout the story. The sub-plots feel detached from the main plot, and while the author managed to tie together disparate threads in the two earlier novels, he fails to do so here. I hoped for something on par with either of the two previous novels, but Iron Council falls short. Two snails. It feels strange to me that books defending evolution and science in general should be needed, and I’m always baffled by polls showing how many people believe the world was created 4000 years ago (or whatever). I live an insulated life. I don’t think the people who should read this book will read it, though. I found the book moderately interesting with some interesting concepts and theories I weren’t previously aware of, all presented in a logical and consistent way. My grade here doesn’t mean the book isn’t good, it just means I feel I don’t really belong to the target audience. Three snails. I have played around with Praat a bit this semester and I have previously published two articles about my adventures in the land of phonetics, one about basic vowel space and one about monophthongs in different languages. I originally intended to write several articles, gradually building up to a guide for how to identify Mandarin syllables in Praat, but since I ran out of time, I’m jumping ahead in the series and publishing this article now. If you wan to try any of this yourself, you can download Praat here. To learn more about Chinese phonetics, I have been playing a little game with my self. I have a large number (1000+) syllables in Chinese recorded by a female speaker. I load one of the syllables into Praat randomly without looking. The goal is to figure out which syllable it is only by looking at it. This is quite possible, although 100% accuracy is probably not achievable because some sounds are too hard to tell apart. I haven’t kept a detailed record of my score, but I think I get it completely right slightly more than 50% of the time and when I’m wrong, it’s usually just a little bit, such as mistaking “tán” for “pán” or similar. The goal with writing this guide is primarily to help myself understand what I’m doing. It’ of course possible that someone else finds it useful, but probably not very many. 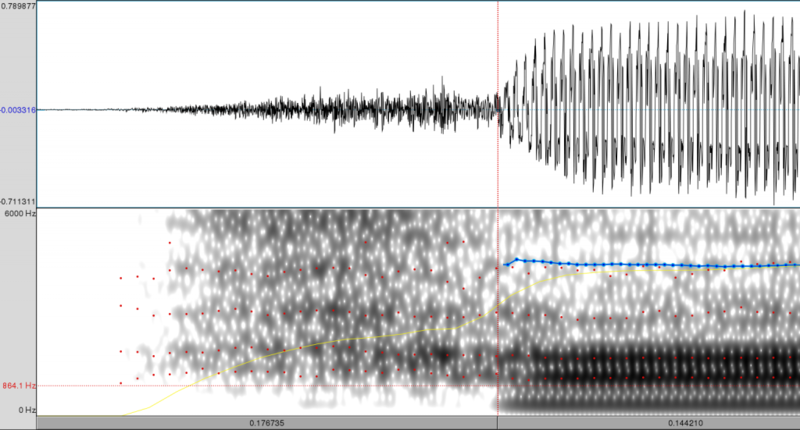 This guide is basically a long discussion of what I do when I (rather successfully) identifies Mandarin syllables just by looking at the spectrogram and waveform. If you have suggestion for how to improve the guide or references that can help me improve accuracy, let me know! Also note that I’m no expert, so please report any errors you find. I have taken a few courses in Chinese phonetics, but that’s about it, the rest I’ve learnt on my own, mostly in Chinese, so sometimes I might use inaccurate vocabulary in English, but it should be okay. Let’s get started! Turning point of T2 and T3, both in ”ma”. T1 and T4, both in “ma”. When trying to determine which syllable we’re dealing with, it’s useful to try to get a general understanding of roughly what kind of syllable stricture we’re talking about first. The following section isn’t meant to determine exactly what these parts are, but rather to pinpoint the number of sounds and general syllable structure. Since Mandarin only has slightly more than 400 syllables (since we have already dealt with tone in step one) and the structure is very rigid (a full syllable is CGVN, Consonant Glide Vowel Nasal, where all parts are optional except the main vowel). It should of course be noted that most of the possible combinations don’t exist or don’t exist for certain tones. Initial consonant: If voiced, e.g. [m n l], it looks like a vowel, but is generally weaker. Stops are usually visible through their releases and fricatives are easy to spot because of the noise-like turbulence. Affricates are combinations of stops and fricatives. Glides and vowels: There is some controversy in phonology if G belongs with the preceeding consonant, the following vowel or if it fills a slot on its own, but for our purposes, it’s probably best consider it a vowel in addition to the main vowel. Final consonants: Final consonants in Mandarin can only be [n ŋ ɻ]. If there seems to be something significant going on after the vowel has ended, it’s one of these finals. None of the syllables I’ve been playing with contains any [ɻ] finals (known as Er hua), so this won’t be part of this guide. 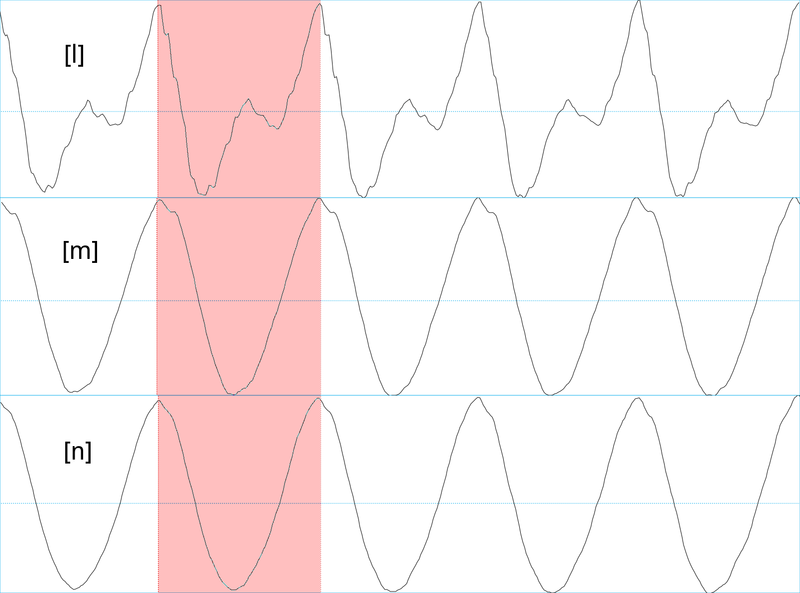 [an]: Note the rise in both F2 and F3 towards the end and the cancellation of F2 as the final begins (anti-resonance, see Identifying nasal consonants). Use this flow chart to figure out what to do next. 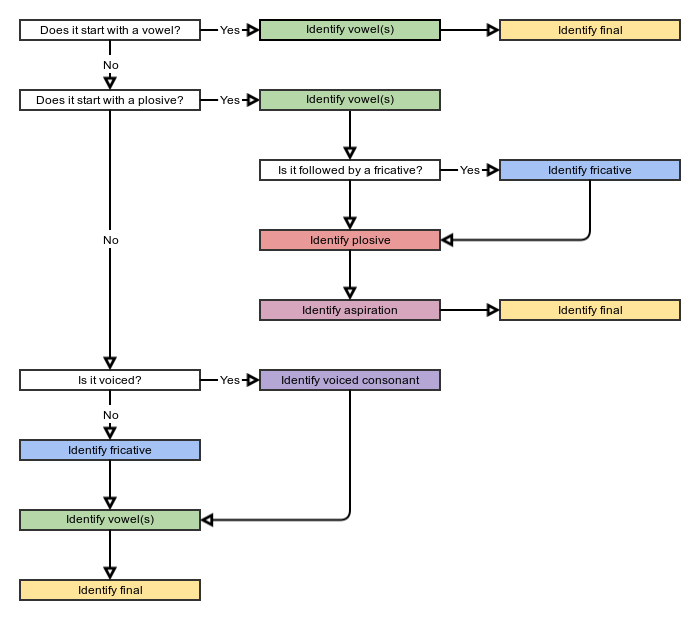 Coloured steps in the flowchart have detailed discussions below. If you have problems with other steps, you probably need to read basic definitions of the relevant speech sounds, please refer to the relevant entries on Wikipedia. Identifying vowels can be tricky by simply looking at one single sample, but it’s still pretty easy to get the right idea by comparing F1 and F2 values. It also helps a lot being familiar with the syllable structure in Mandarin, because some monophtongs or diphthongs simply don’t occur in certain environments and can there fore be excluded. For instance, if you think the syllable ends with a nasal, you don’t need to worry about the subtle differences between [i] and [y] because if there’s only one vowel sound, it has to be [i] because [y] can’t be followed directly by [n] or [ŋ]. Similarly, if you can identify one of the sibilants [ɕ ʂ s] accurately, you don’t need to differentiate the allophones of /ɨ/ because these are in complementary distribution. So if you can’t identify the vowels exactly, narrow it down to a range of possible answers based on the general syllable structure. You will probably be able to guess which vowel it is later once you know more about the preceding and following sounds. However, it should be mentioned that vowels are usually the easiest to guess, so you probably want to gain as much information as possible in this step so you have fewer possibilities later. There are three finals: [n ŋ ɻ]. All of these influence the preceeding vowel to different extents (a lot in the case of [ɻ]) so identifying the final involves looking at the preceeding vowel as well, not just the final itself. In the case of [ɻ], there are some general signs (such as a drop in F3 which will approach F2), but more detailed knowledge of how Erhua influence the preceeding vowel(s) is probably necessar (see 朱川, 2013, or the article about Erhua on Wikipedia). In general, the spectrum should start approaching that of [ɻ] during the pronunciation of the vowel. [ɑŋ]: Both F2 and F3 are dropping rather than rising. Identifying these finals only by looking at the finals themselves is hard, but as noted, [n] is more likely to have F2 cancelled out. This is far from completely reliable, though, but it is a clue. Fricatives all have noise-like turbulence and can be told apart by looking at the energy of the turbulence at different frequency ranges. In Mandarin, there are six fricatives [f ɕ ʂ s x ʐ]. Let’s first deal with some of the easier ones. [ʐ] can be esaily identified because it’s voiced (see Identifying voiced consonants below). Remember to combine the information about the fricative with the following vowel since many of the fricatives are in complementary distribution. [f] is a non-sibiliant and generally a lot weaker than the other fricatives (including [x] and shouldn’t be too hard to identify. The energy is also quite uniformly increasing with frequency (see picture below). Now let’s have a look at the three remaining fricatives [ɕ ʂ s]. The first thing you need to do when identifying fricatives is to make sure you’re displaying the whole spectrogram (Praat is by default set to show 0-5000, which is not enough; set the upper limit to at least 10000, possibly even 15000). If you don’t know anything about the speaker, it will be difficult, because all of these things are individual, but if you see a few sample, you can still calibrate your guesses. The easies way to deal with [ɕ] is to look at the following vowel (which is usually relatively easy to identify). Since [ɕ] is in complementary distirbution with [ʂ s], we will only look at how to tell the latter two a part here. 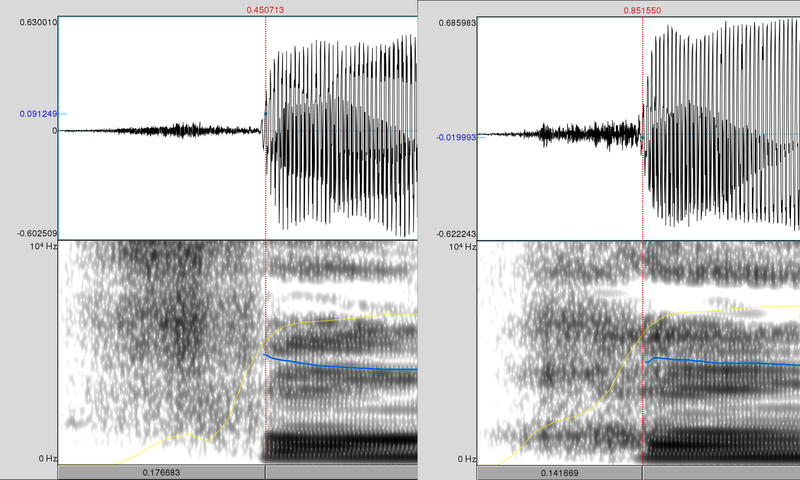 In general, the main difference between the retroflex affricate [ʂ] and its non-retroflex friend [s] is that the intensity of [ʂ] starts much, much lower, see the spectrograms of ”sa” and ”sha” below. The exact freqncy ranges might be different depending on the environment, so [ʂa] might not be identical to [tʂa], but the general trend is still there (and the difference is usually very large). Non-retroflex (sa) vs. retroflex (sha). This is by far the hardest part and I don’t think it’s theoretically possible to reach a very high accuracy. The reason is that the stops are too brief to identify properly and aren’t in complementary distribution, so looking at the following vowel seldom help. The only clue is often formant transitions. According to locus theory, all consonants have a target frequency for each formant, even though this might be influenced by adjacent sounds. This means that the transition of the formants (F2 and F3) can help us identify the plosives themselves. This picture is taken from Kevin Russel’s phonetics site (Univeristy of Manitoba). Read more here, here and here. This is all very good in theory, but I find it very hard to actually use this to determine the plosive in question. Sometimes the transitions are hard to see or they simply don’t fit the patterns described above. Identifying aspiration is usually not very difficult, but can be somewhat complicated by affricates (which look al ittle bit like aspirated stops) and aspirated affricates such as [t͡ɕʰ t͡sʰ ʈ͡ʂʰ]. Let’s start with the main difference between the non-aspirated stops [p t k] and their aspirated counterparts. VoT of aspirated and non-aspirated [t] in “da” and “ta” respectively. The aspirated affricate [t͡sʰ]. Note the similarity to [s] and [h]. Both fricative [s] and apsiration [h] clearly visible in [t͡sʰ], “ca”. 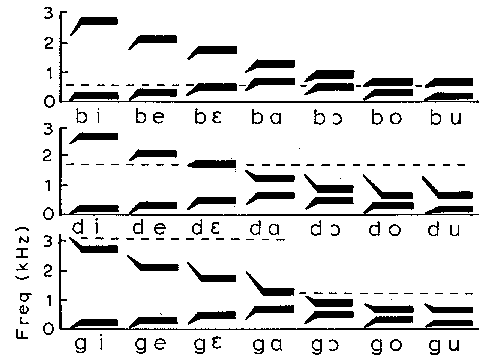 Only fricative [s] visible, only minor gap before start of vowel. If you can’t see the fricative, you probably need to adjust the spectrogram settings. The above diagram stops at 6000 Hz, which isn’t really enough to analyse fricatives, see Identifying fricatives above. [ʐ] is easy to identify because it’s the only voiced fricative, ”ran”. The remaining three are much, much harder and are often indistinguishable just by looking at the spectrogram because they have similar F1 and F2. I have found no way of reliably telling them apart this way, but there are clues in the waveform. I have found no reliable way of separating [m n], but F2 seems more likely to be cancelled out by anti-resonance in [n] compared to [m]. Formant transitions for [m] are similar to those for [b p], while those for [n] are similar to [d t s z], but this can be very hard to see. Read more baout this here. I’d be really surprised if anyone actually reads this far, but if you do and think this is interesting and/or fun, feel free to have a go at the following spectrograms. Which Mandarin syllables do they represent? Post a comment with your answers! It’s been both entertaining and educating to write this guide. There’s obviously more to spectrogram analysis that I have written here. My goal was simply to use what i have learnt in the past year or so to see what I could do with Mandarin syllables (which are a lot easier to analyse than, say, English or Swedish). This article probably contains some errors, so if you find anything that looks weird let me know! If you want more challenges, you can head over to Robert Hagiwara’s Monthly Mystery Spectrogram page. It hasn’t been updated for a long time, but it still contains a lot of useful information! Here is a list of books, articles and websites that I’ve found useful. I also want to thank professors 朱川 and 曾金金 whose courses in phonetics I have attended. It’s so much easier to learn these things in collaborative discussions in class compared with on one’s own! Boersma, P., & Weenink, D. (2005). Praat: doing phonetics by computer (Version 4.3.01). Chao, K. Y., & Chen, L. M. (2008). A cross-linguistic study of voice onset time in stop consonant productions. Computational Linguistics and Chinese Language Processing, 13(2), 215-232. Duanmu, San. (2007). The phonology of standard Chinese. Oxford University Press. McQuarie University. (2008). Speech Acoustics Topics. Wikipedia. Acoustic phonetics (and related topics).